On the eve of India’s landmark General elections in April-May Protected content , Ruchir Sharma offers an unrivalled portrait of how India and its democracy work. 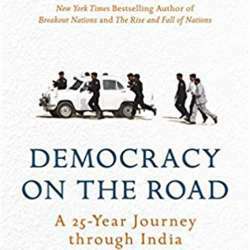 Sharma has covered every election for the last two decades on the road talking to farmers, shopkeepers and CEOs across the country, and interviewing leaders from Narendra Modi to Rahul Gandhi. The ultimate message of his travels is that, while democracy is retreating in many parts of the world, it is thriving in India. “Democracy on the Road” will be available for sale at the event. You will have the opportunity to purchase a copy of the book at this event. Ruchir Sharma (@ruchirsharma_1) works at Morgan Stanley; he has authored of the international bestseller The Rise and Fall of Nations: Ten Rules of Change of in the Post-Crisis World Protected content .